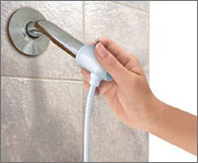 The H2Oral Irrigator only takes a few steps to install onto your bathroom showerhead. 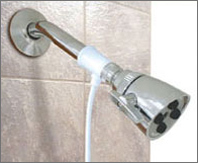 When tightening the Adapter to the showerhead, hang the tubing straight down to prevent kinks. 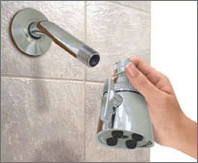 Place a layer of Teflon tape on the male threads of the shower pipe and the Adapter to help seal the threads and prevent leaks. Thread Adapter onto shower pipe being careful not to strip threads. Clean surface with alcohol then, peel tape and attach Wall Hanger. © Copyright All Rights Reserved Website design and development by: Epiphany Web Design Studio, Inc.